I've been encouraged to steal today. Following Jeff Goins' 15 Habits of Great Writers series is really challenging me and pushing me out of my comfort zone (especially by having to do things like, you know, actually start writing..., but this 'habit' I actually find easy. Stealing, borrowing, being inspired by, whatever you want to call it, I find inspiration in the world around me every day - I'm just not consistent at actually translating that into anything on a regular basis, so I end up with stories, ideas, blog posts and the like bouncing around in my head, never seeing the light of day. So the challenge for me is to actually do something with my inspiration, and when I read Jeff's post on 'stealing', the image above was the first thing that came to mine. I don't remember when I first came across this quote, but I saw this version of it on Facebook a few weeks ago, and I've been thinking about it every day since. Ever since I bought my house (nearly 3 years ago), I've been wanting to put a big canvas on the wall of the front entrance, the first thing you see when you walk in the door. When I saw this quote again, I knew it was exactly what I need to put there. I love the idea of people opening the door and being greeted by this question, but even more so, it's been making me think about my own answers. You know, I feel like I don't really know what I want to do with my own one wild and precious life. I'm nearly 36 years old, and I'm still trying to work out what it is I want to do when I grow up. I don't think this is a bad thing, not being able to see the path of my life before me, and my experience of living to date has shown me that really, nothing goes to plan and you'll cope with the rollercoaster of life better if you learn to just hang on for the ride. When people talk about their goals, their dreams, what it is they're working towards, I sit in quiet contemplation of the fact that I don't really have any of those, not in a defined, this-is-what-I-want-and-this-is-how-I'm-going-to-get-there manner. I have concepts and abstract notions of what I want to do, the sort of person I want to be, but as for tangible, definable goals? Not really on my radar at the moment. I think the last few years have been a time of trying just to deal with the every day and all that it brings, of playing catch-up and at times of simply hanging on for dear life, I haven't had the capacity to dream, to dare to think 'what if.....? ', to allow myself the luxury of identifying what it is that I desperately want to do, to be. To be brutally honest, I'm scared of doing that. Because if I do, I might fail, yet again. And we all know that it's easier and less painful to not try in the first place than to crash and burn, don't we? I know I focus more on my failures and lack of achievements than the things I have accomplished, which is the complete opposite of what I encourage people in my life to do, both personally and professionally. I know I need to shift that perspective, to see what I haven't been able to to as steps along the way to what I have done. I dropped out of uni after I finished high school, but I went back 11 years later and got my degree. I failed as a wife, but I now know the true purpose of marriage and try to encourage the married couples around me in their discovery of the same, and am content in my own singleness. I feel like I fail as a mum every single day, but I keep trying to learn from my mistakes and to be the best mum I can be. I have abandoned every single art/craft I've learnt at some point along the way, because I'd give up if I couldn't make it perfect, I wasn't willing to make it ugly, when my frustrations became overwhelming and I couldn't make it turn out exactly how I'd envisioned it. Now my motto is 'done is better than perfect', and wouldn't you know, I'm creating again. I have avoided writing again for so long it, but now I'm writing everyday and finding my voice. The writing is easy, it's what I do with it that still strikes fear deep within. I know it is not God's intention for my words to remain hidden, just between me and Him, but the thought of putting myself 'out there' brings the ultimate fear of rejection. I am learning that the world needs our voices, because we all have a story to tell. I am continuing to learn that a life lived in fear is a life half lived, and I refuse to live in the shadow of fear anymore. 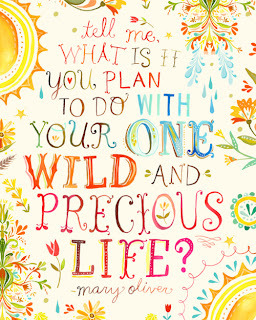 So now what do I plan to do with my one wild and precious life? 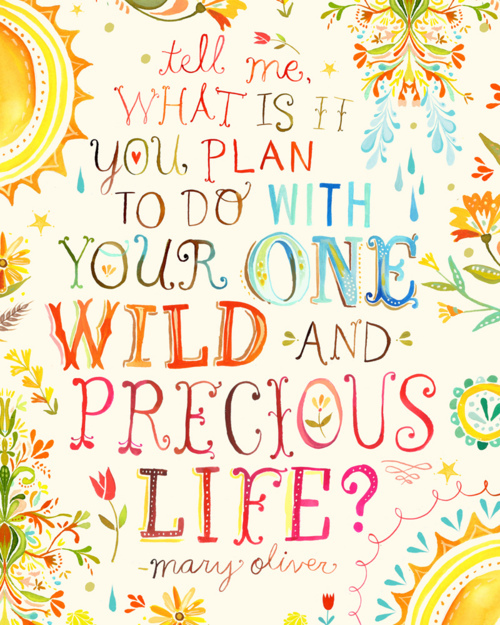 I plan to live wildly free, to live the life that God intended, live it to the full. To stop living in fear, because a life lived in fear is a life half lived, and I refuse to live in its' shadow anymore. Wild and precious...? How much of our lives is dictated by others - how much should it be? We give ourselves up to noble causes (like our kids, our jobs, our various voluntary causes) just as we should; but then we find our our diaries and timetable full of all kinds of commitments. Still precious but the wildness tamed! A full life where we can respond to love whenever and wherever we find it or see it ready to blossom.